Images: Subculture: Microbial Metrics and the Multi-Species City by Kevin Slavin, Elizabeth Hénaff, and David Benjamin / The Living. Photos by Rafael Gamo. 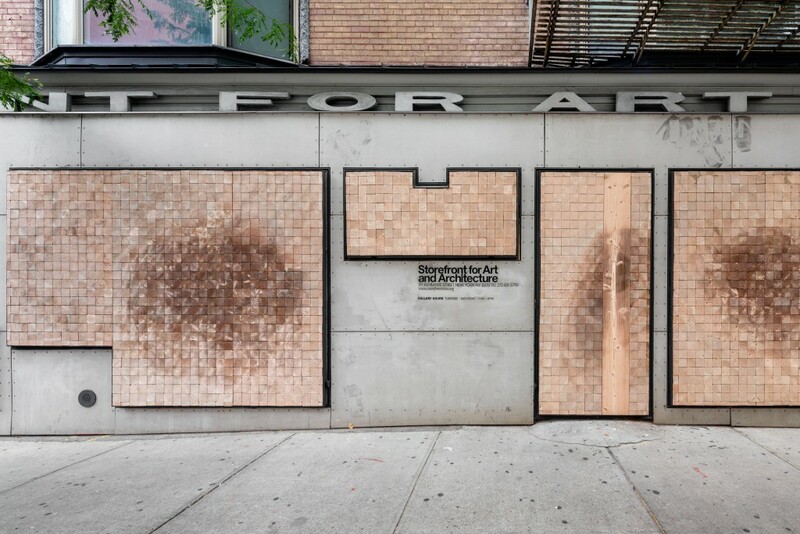 Commissioned by Storefront for Art and Architecture, 2018. What are the microbial metrics of our urban spaces? The species that occupy our cities are much more abundant and diverse than we know. The “Tree of Life” — an index of all biological organisms on earth — indicates that 99% of all life on earth is invisible to the human eye, both unnamed and unnoticed. Archaea and bacteria dominate the genetic weight of nature, consisting of everything from pathogens that give us the flu, to microbes that raise plants from soil. Unicellular organisms exist at the bottoms of oceans, in subzero environments, and even in radioactive exclusion zones. In our cities, microbial ecologies are uniquely complex. Cities are filled with people, and these people are in turn filled with billions and trillions of microorganisms. Over the past decade, this notion has become familiar through the popularization of the so-called “human microbiome,” a unique microbiological ecology in the gut of people. But does New York have a gut biome? Is it different from the gut biome of Tokyo? Lagos? Hyderabad? Is the gut biome of Soho distinct from the gut biome of Jackson Heights? How does diversity, demographic and microbial, affect medical, social, and even interpersonal outcomes for the people who live in each city? The “culture of cleanliness” around health and domestic spaces has framed microbes as pathogens, disease agents to be avoided and repelled at all costs. From the chemical sanitization of sheetrock to the controlled acidity of concrete in new construction, thousands of anti-microbial decisions are compounded in the design and policy of our cities, undermining the importance and actual presence of legitimate bacterial diversity in our urban lives. Until recently, it’s been impossible to understand exactly what’s around us, inside us, and always under our feet. But recent advances in a field called metagenomics allow us to extract genetic “fingerprints” of microorganisms that we can’t otherwise track, and to shepherd a new understanding of the value of microorganisms, rather than an interest in eliminating them. Subculture: Microbial Metrics and the Multi-Species City uses this new understanding to reframe the value of the urban landscape around us. The exhibition brings together work in biology, data science, material science, and design to flip the notion of a “healthy” city on its sterile head. 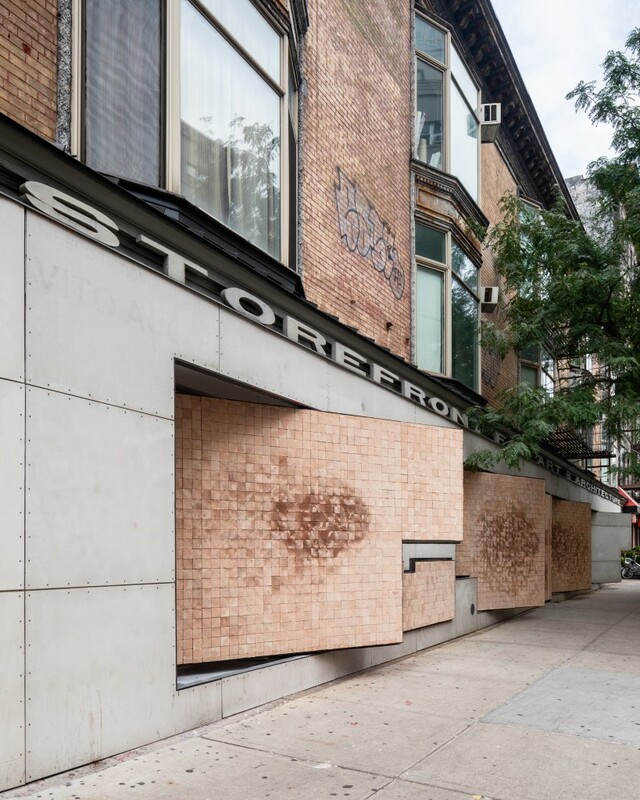 An active metagenomic sequencing laboratory in Storefront’s gallery space explores the invisible ecologies of our built environment, provoking deeper analysis of the character and evolution of the abundant genetic landscape of our cities. Ultimately, Subculture questions the common perceptions of our interactions with the microscopic world, providing insight into the future of design. It proposes future-oriented practices of data collection and interpretation that can produce new modes of environmental perception. The installation in the gallery space, along with the scientific analysis of various sites across the city, gives us a model to broaden our realm of inquiry, pushing for greater resilience, diversity, and responsiveness of the urban fabric, and arguing that the collective future is a lot more collective than any of us can see or imagine. Subculture utilizes the technological innovations of small-scale genetic sequencing devices to transform Storefront’s gallery space into an active “urban metagenomic sensor.” As a living environment and analytic laboratory, it collects, extracts, sequences, and analyzes the microbial life of its immediate environment. 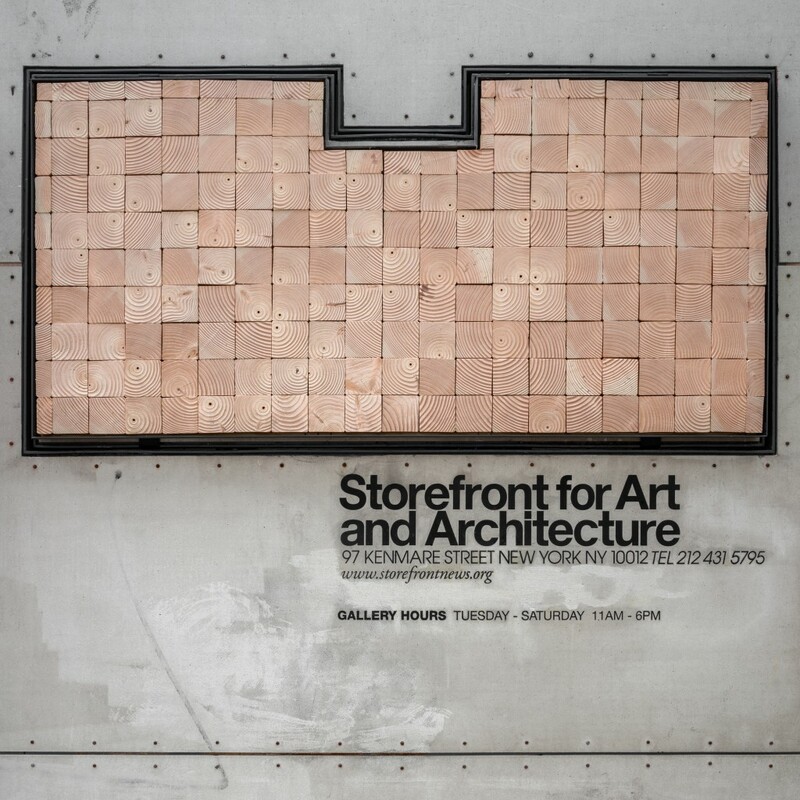 As a sensing device, the façade of Storefront’s gallery space is supplemented by a simple bio-receptive material: wood. Previously a living host for species such as beetles, worms, fungi, and bacteria, wood—even in its inert state as a building material—is a well-suited home for microbial life due to its molecular composition and its micro and macro shapes. 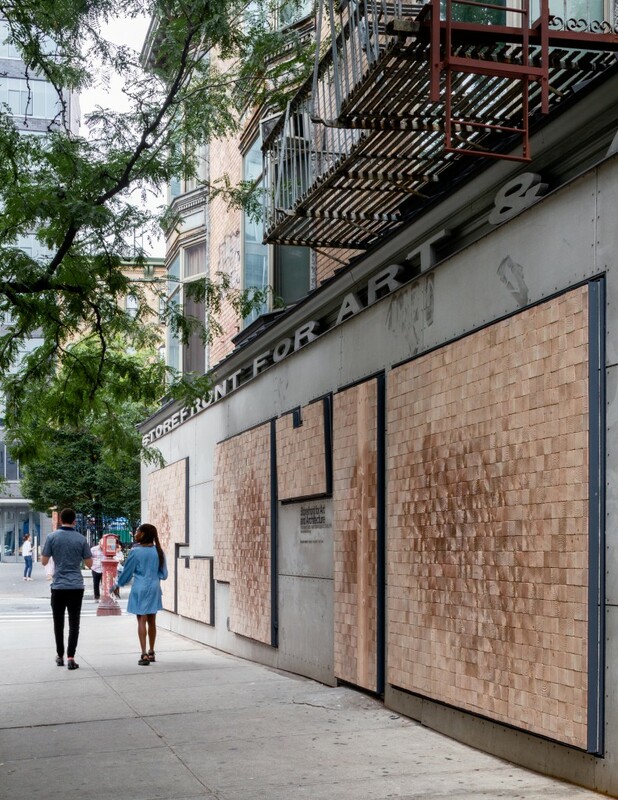 During the course of the exhibition, accreted genetic material will be extracted from bio-receptive wooden tiles installed on Storefront’s façade and in particular sites across New York City. The materials, exposed directly to their environments, will undergo an extraction and analysis process designed to indicate the metabolic functions of their geographically-specific microbiome. The microscopic interactions with the built environment may reveal information about the origins, actions, and destinations of the humans and animals in the neighborhood, the pollutants present in the air, and potentially entirely new frameworks yet to be understood. All of the material choices selected for a given microbiome (and the characteristics of common materials that affect microorganisms, such as texture and pH) are not readily visible to humans. A seemingly flat surface might be riddled with microscopic mountains and valleys. A texture rough to our touch may not present relief when observed at the micro scale. How do we design materials that aim to host these microorganisms, taking into account the sensibilities and needs of multiple species? 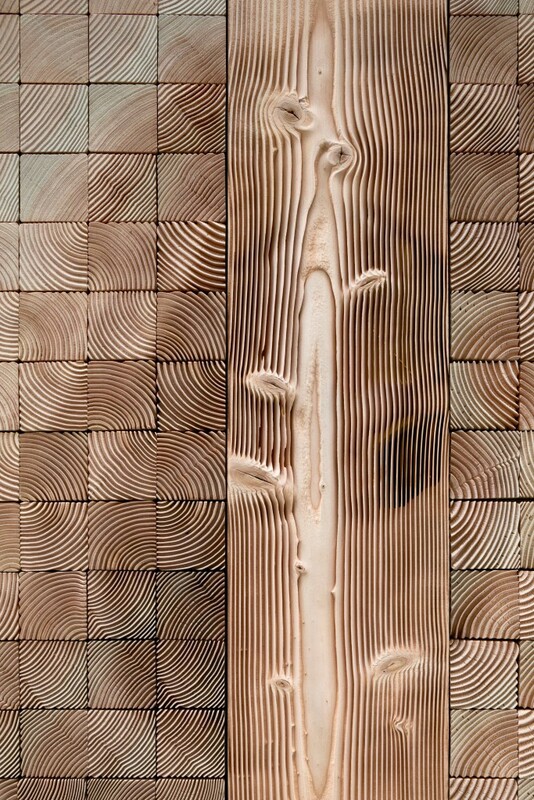 On the facade, wood tiles cut from standard lumber are deliberately eroded through sandblasting at various depths. Unlike milling or cutting, sandblasting enhances the variation in wood by eroding soft areas and leaving behind hard areas, revealing the unique characteristics of each piece of wood. 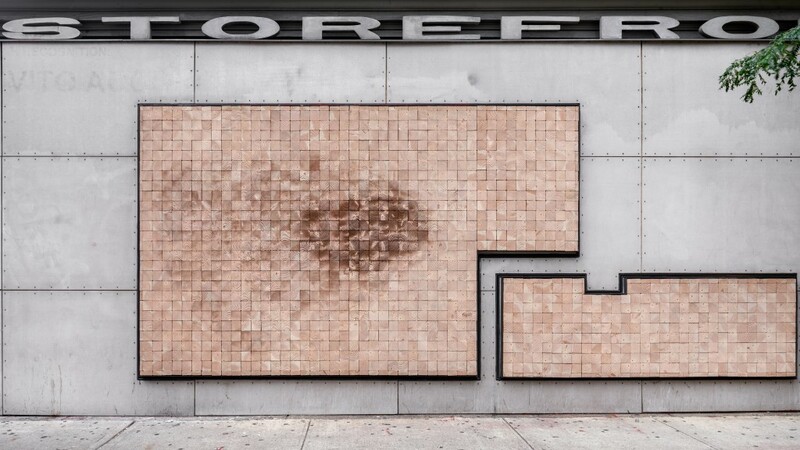 The tiles are assembled on the panels of Storefront’s facade, forming a pattern of diverse microclimates. Each microclimate has distinct grains and knots that form different pockets of shade and moisture, collecting and hosting microbes throughout the duration of the exhibition. 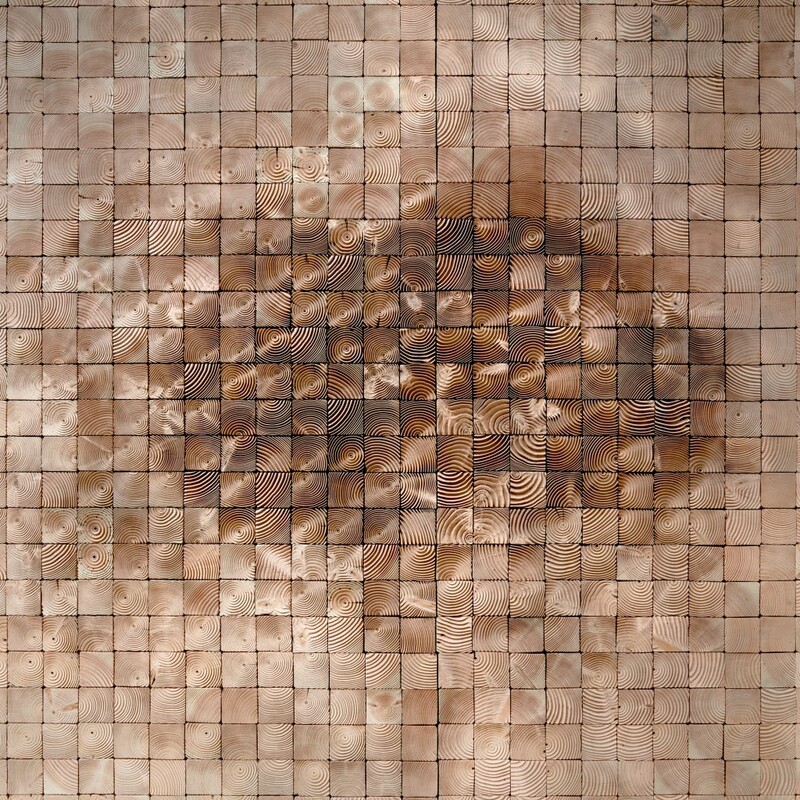 These microbes are present in the micro texture on the surface of the wood, through deep channels in the wood grain, and through twisting fins that serve as a filter for air passing between the exterior and interior of the gallery. 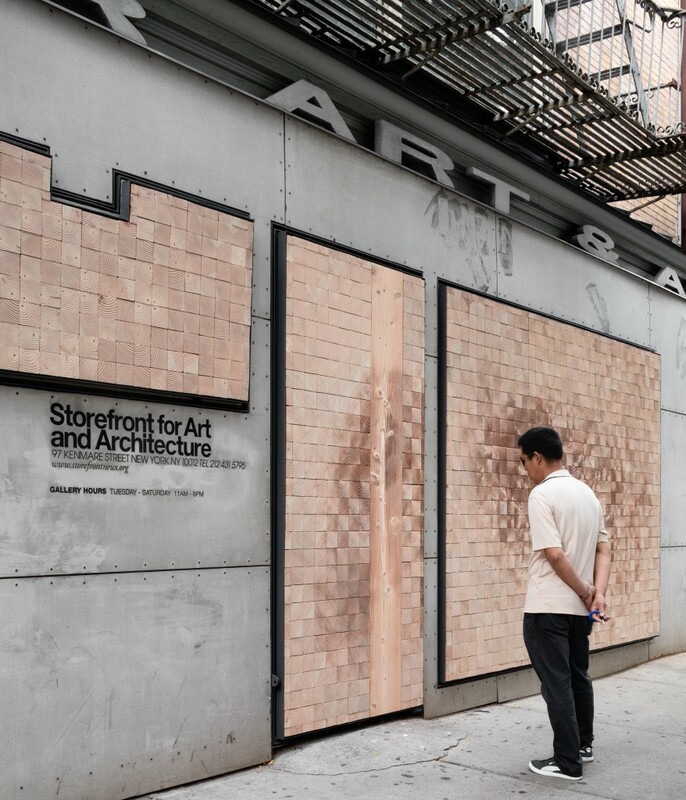 Eschewing our common modes of cleanliness and sterility, the façade installation provokes us to think of buildings as complex and living. How do we transform that which is inert, flat, and uniform be be into something alive and textured? As our methods, tools, and mindsets for design shift, we move toward the imagination of a new and living forms of architecture. 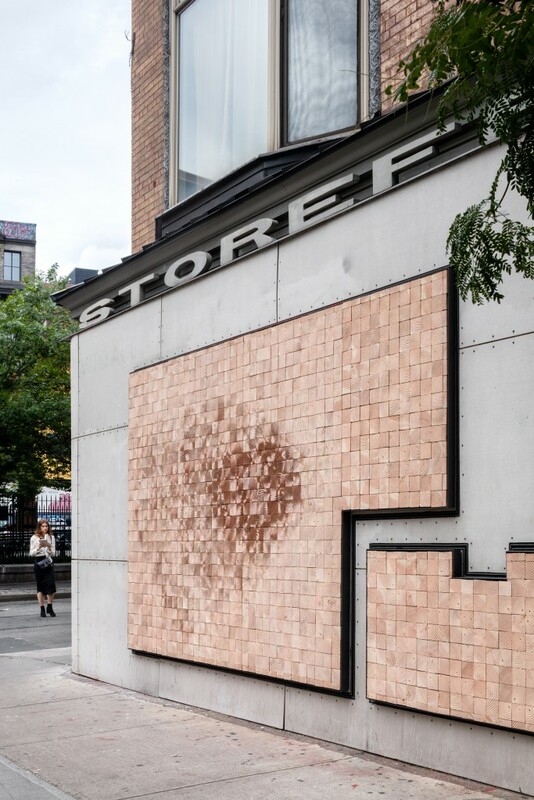 Subculture projects a bioreceptive consciousness of cities and spaces, exposing the public to an invisible layer of analysis that is rewriting our understanding of the health, ecology, and identity of our buildings and spaces. The Living is a design studio and an experiment in living architecture. Its work focuses on expanding the definition of environmental sustainability through the frameworks of biology, computation, and a circular economy. The studio has won design awards from the American Institute of Architects, the Architectural League, the Mies Crown Hall Americas Prize, the Museum of Modern Art, Ars Electronica, the German Federal Government, and Holcim Foundation. Recent projects include the Embodied Computation Lab (a new building for research on sensors and robotics) and Hy-Fi (a branching tower made of a new type of biodegradable brick). A monograph about the studio, Now We See Now: Architecture and Research by The Living, will be published by The Monacelli Press in Fall 2018. The studio team is: David Benjamin (Founding Principal), John Locke, Danil Nagy, Damon Lay, Dale Zhao, Jim Stoddart, Ray Wang, and Lorenzo Villaggi. Evan Eisman Company is a design, fabrication, and finishing studio based in the Brooklyn Navy Yard that specializes in incorporating blast finishes and engraving into art, architecture, and design. The studio pursues innovative, high quality work in a diverse array of materials, and values creative collaboration within its team and with clients. The studio’s projects range from monumental glass murals to jewel-like engravings, and they can be found throughout New York City in museums, parks, residences, and retail spaces. Evan Eisman Company has been developing its sandblast works since 1998. Subculture: Microbial Metrics and the Multi-Species City is supported by a grant from the National Endowment for the Arts. Pro-bono and institutional support for this exhibition is kindly provided by Evan Eisman Company and the Hénaff Lab at NYU Tandon School of Engineering. 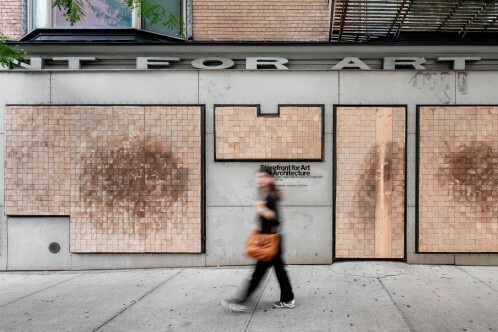 Storefront’s programming is made possible through general support from Arup; DS+R; F.J. Sciame Construction Co., Inc.; Knippers Helbig; KPF; MADWORKSHOP; ODA; Rockwell Group; Tishman Speyer; the Foundation for Contemporary Arts; The Greenwich Collection Ltd.; the Lily Auchincloss Foundation; the New York State Council on the Arts with the support of Governor Andrew Cuomo and the New York State Legislature; public funds from the New York City Department of Cultural Affairs in partnership with the City Council; The Peter T. Joseph Foundation; and by Storefront’s Board of Directors, members, and individual donors.